Our speaker for February was Professor Mark Birkinshaw from the Cosmology and Astrophysics Department of Bristol University. He gave us a talk entitled, "Active Galaxies: Bubbles and X-rays". He started by showing us some images of radio galaxies, jets and lobes, taken over the past fifteen years. Although these images were interesting, it was not really very clear what exactly we were looking at. However, it soon emerged that this was merely an introduction, leading into the spectacular results we now see from the Chandra X-ray Observatory. NASA's premier X-ray observatory was named Chandra honour of the late Indian-American Nobel laureate, Subrahmanyan Chandrasekhar. Professor Birkinshaw's interest in this X-ray telescope comes both from receiving images and the fact he was very much involved in its construction for over five years. He was present for all three launch attempts onboard the later ill-fated Columbia. The first launch attempt was aborted with six seconds to go, when a hydrogen leak was discovered. The next day, a second attempt was halted by a thunderstorm. It finally took off another day later on 23 July 1999. Five seconds into the flight, the astronauts asked Mission Control "Could we have our computers back on?". Luckily the backup systems worked and the mission continued successfully. It was later learnt that a bolt had come out inside one of Columbia's engines and had punctured a hole in a hydrogen tank. Could this have been the reason for the first aborted launch? One hour into the flight, Chandra was launched. It then took about six weeks for the gas that was present in our atmosphere to seep out; otherwise it could cause electrical arcing, which could destroy the electronics. 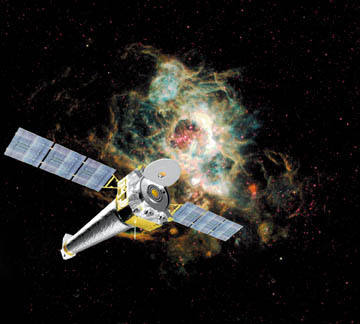 When the first images by Chandra were examined, something looked very wrong. An image of a quasar was oddly shaped, bringing memories of the optical fault in the Hubble Space Telescope to mind. However, what they were actually seeing was a jet of superhot gas coming from the the quasar. These jets can travel at nearly the speed of light away from a galaxy and may be caused by the accretion disk around a black hole ejecting matter back into space. This discovery started a search for more quasar jets. 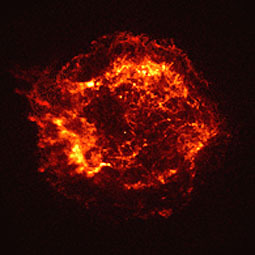 The images from Chandra are far better than those from the radio telescopes used on Earth. Chandra has opened our eyes to the universe and by combining radio, X-ray and optical images new boundaries are unfolding all the time.